1) Conflict disconnects us, potentially derailing us. 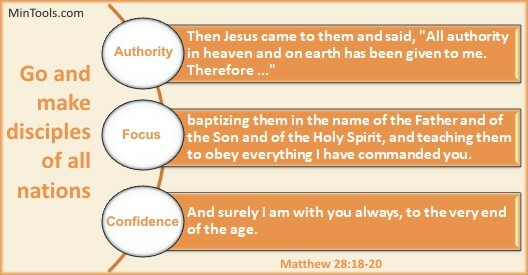 Think about Jesus’ words, “All authority in heaven and on earth has been given to me” (Matt. 28:18). We’re like a train on a track to fulfill His mission. Jesus as the Head, like the engine of the train, not only leads the way but also provides the power for us. Since He’s the One with the authority, not us, who are we to try to control the journey? Who are we to demand our way? A disconnect from Him can cause a disconnect from others and pretty soon we derail. Remember, “From him the whole body, joined and held together by every supporting ligament, grows and builds itself up in love, as each part does its work” (Eph. 4:16). Our connection to the Head, the One with all authority, should serve to unite us, not tear us apart as we let Him determine what is the right way to go. 2) Conflict distracts us, potentially diminishing the eternal good God wants to do through us. Think about Jesus’ command to “go and make disciples of all nations, baptizing them in the name of the Father and of the Son and of the Holy Spirit, and teaching them to obey everything I have commanded you” (Matt. 28:18-19a). It’s hard to focus on making disciples when distracted by trying to put out the fires set ablaze from conflict. And, it’s hard for people to see the value of becoming disciples when they see Christians at odds with one another, no different than the world around them. Are the issues we’re dealing with really all that important in light of eternity, in light of our mission to make fully devoted followers of Jesus? Rarely does our conflict have to do with disciplemaking but even when it does, we need to step back and ask, “But what does it matter?” That’s what Paul asked when some were preaching Christ “out of envy and rivalry, but others out of goodwill” with the one doing it out of selfish ambition and the other out of love (Phil. 1:15-19). Rather than getting distracted by it and letting it lead to discord, he concluded, “But what does it matter? The important thing is that in every way, whether from false motives or true, Christ is preached. And because of this I rejoice” (Phil. 1:19). Are the issues and how we react to them going to lead to the development of fully devoted followers of Jesus? Paul confronted the way the church in Rome was dealing with certain issues saying, “Do not by your eating destroy someone for whom Christ died. … Do not destroy the work of God for the sake of food.” (Rom. 14:15-19). When we let our personal preferences and opinions consume us, we not only become distracted from the mission God gave us to do but can cause harm in the lives of those for whom Christ died. Our common cause to be and to make fully devoted followers of Jesus, should help us regain perspective and quickly come into alignment. 3) Conflict dulls our light in reflecting Jesus, potentially destroying our testimony of Him. Think about Jesus’ promise, “And surely I am with you always, to the very end of the age” (Matt. 28:20). Not only does Jesus’ presence gives us the confidence to get beyond our insecurities that so often drive defensiveness but it also fuels a desire within us for others to experience that same power in Him. But, if all they see is our bickering and fighting, His presence won’t be sensed. We need to ask if the way we treat each other reflects His presence. Jesus said, “A new command I give you: Love one another. As I have loved you, so you must love one another. By this everyone will know that you are my disciples, if you love one another” (Jn. 13:34-35). This entry was posted in Conflict Management.